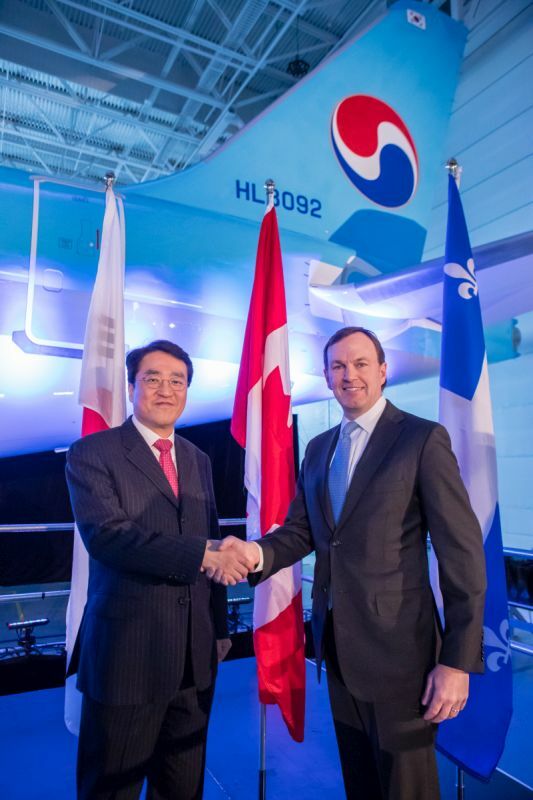 "This is a very important milestone for the C Series program because it is our breakthrough into the fast-growing Asian market, and we are honored to have Korean Air Lines as our brand ambassador in the region," said Fred Cromer, President, Bombardier Commercial Aircraft. "We expect that over the next 20 years, Asian operators will take delivery of 2,870 small single-aisle aircraft. We are thrilled that Korean Air is the first in the region to showcase the CS300 aircraft's outstanding performance and capabilities." "We have witnessed the C Series impressive first year in service, and are pleased to take delivery of our first Bombardier CS300 aircraft," said Soo-Keun Lee, Chief Technology Officer, Korean Air Lines. "When we selected the aircraft in 2011, we knew it would be a great addition to our fleet. Today, it is the most efficient aircraft in its class, and its passenger comfort is outstanding. The CS300 aircraft will enable us to reinforce our regional single-aisle operations, while providing a high level of profitability and customer satisfaction. These are key drivers of our decision to acquire the Bombardier CS300, and we are looking forward integrating it to our fleet." 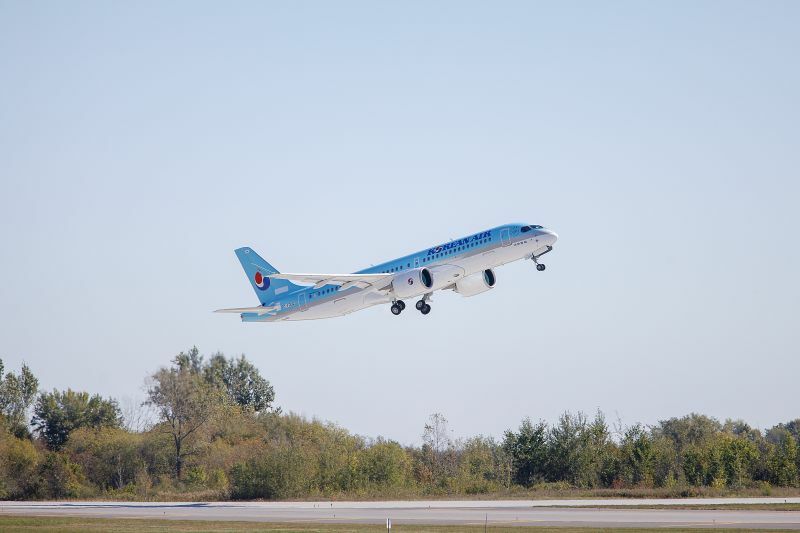 "We are thrilled for Korean Air to receive their first CS300 aircraft," said Rick Deurloo, Senior vice president of sales, marketing and customer support at Pratt & Whitney. "Pratt & Whitney has shared a long standing relationship with KAL dating back to the late 1940's and we look forward to powering their new-generation fleet." The CS300 aircraft will allow Korean Air to allocate its larger single-aisle jets and wide body aircraft to routes requiring their capacity and "right size" the Bombardier jet to lower-density regional routes. Korean Air may later take advantage of the CS300 aircraft's range and expand internationally. Korean Air Lines is expected to take delivery of their second CS300 before year-end - another 127seat dual-class configuration with Premium Economy and Economy seating. Korean Air's firm order for 10 CS300 aircraft, with options for 10 and purchase rights for an additional 10 was announced on July 29, 2011, following the Letter of Intent announced a month previously at the International Le Bourget Paris Air Show. Korean Air is one of the world's top 20 airlines and carried more than 26 million passengers in 2016. Korean Air operates over 460 flights per day to 123 cities in 43 countries on six continents with a fleet of 175 aircraft. With its modern aircraft and over 20,000 professional employees, Korean Air offers customers convenience and comfort. Korean Air's award-winning offerings of Korean and international meals and state-of-the-art inflight entertainment system provide passengers with a memorable inflight experience. The airline is a founding member of the Sky Team airline alliance, which together with its 20 members, offers its 612 million annual passengers a worldwide system of more than 16,320 daily flights covering 1,052 destinations in 177 countries. 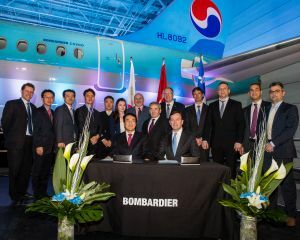 Images of CS300 aircraft are posted with this news release at www.bombardier.com. Bombardier, CS300 and C Series are trademarks of Bombardier Inc. or its subsidiaries.